The Elements Triple Cabinet, designed by Al Glass and Jason Guidry for BDI, is an eye-catching, versatile media cabinet and storage console that combines form and function with finesse. The door panels of the cabinet, which are backed with perforated metal to conceal its contents, are crafted using laser-cutting technology to create a 'ricochet' pattern. 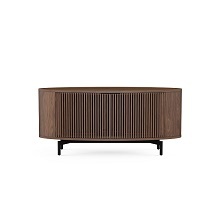 The cabinet is three compartments wide and contains an upper compartment that can store a soundbar speaker. 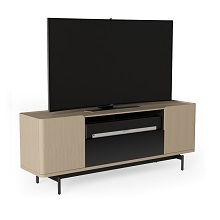 Shown with a natural walnut finish with ricochet-patterned doors and a console base.